Electrical systems are the lifeblood of your work, and proper maintenance is essential to the safety of your facility and your employees. 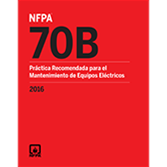 Get guidance you can trust in the Spanish edition of NFPA 70B: Recommended Practice for Electrical Equipment Maintenance. Used alongside the requirements in the Spanish edition of NFPA 70E®: Standard for Electrical Safety in the Workplace®, NFPA 70B helps facility managers develop and carry out an effective Electrical Preventive Maintenance (EPM) program for all types of equipment and assemblies. Contractors look to NFPA 70B for information about properly servicing equipment, and designers depend on it for developing specifications for installation that take maintenance into account. Loose connections are a significant contributor to maintenance issues. That's why the 2016 Spanish edition of NFPA 70B includes new torque requirements that help minimize risks related to poor connections, which have the potential to cause overheating, intermittent open circuits, and electrical arcs. In another change, enhanced battery testing and maintenance requirements provide greater detail about battery testing and safety considerations for anyone performing battery maintenance. Batteries are part of many electrical systems and some are critical to power systems involved in life safety.